Stunning Design. Built To Last - This Salad Spinner is manufactured from the highest quality Stainless Steel. 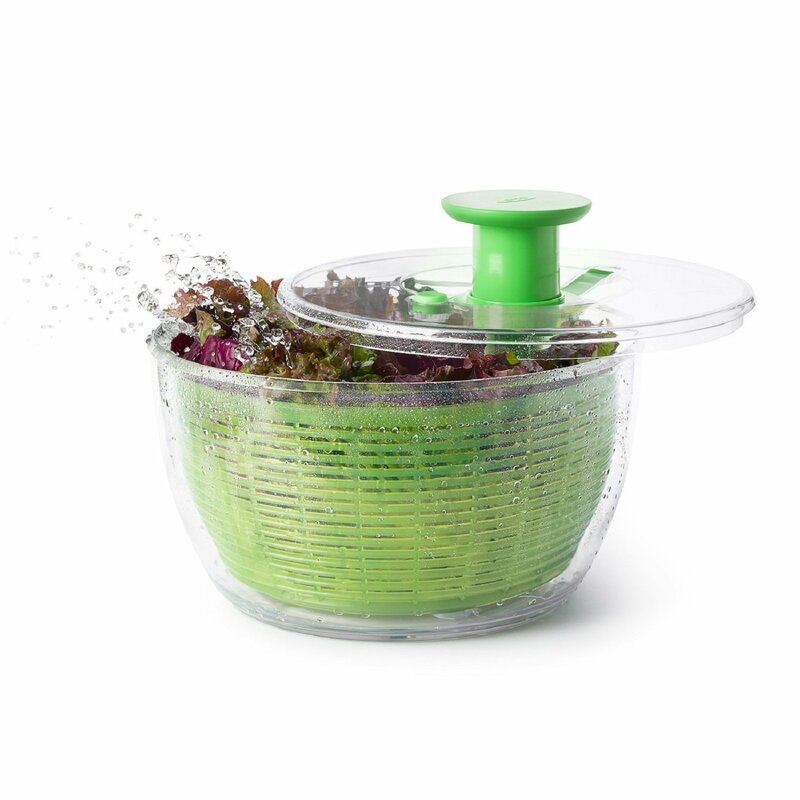 Simple To Use - Our Pull-Dry Mechanism creates an ultra fast spin which works together with the non-skid, silicone base to hygienically dry your salads in no time at all. With so many appliances and kitchen tools on the market today, you might wonder if you really need most of those devices. From specialized graters to melon ballers, dozens of tools may fill up your kitchen drawers and cabinets. There is one tool, however, that’s a practical and healthy addition to your home. The old-fashioned salad spinner has been around for decades, and it continues to evolve as product manufacturers add on those coveted accessories or advanced features. This kitchen tool will tempt your entire family to eat healthy each day with the fun, spinning mechanism that’s inherent to this product. Browse through some of today’s best salad spinners to make your educated, purchasing decision. 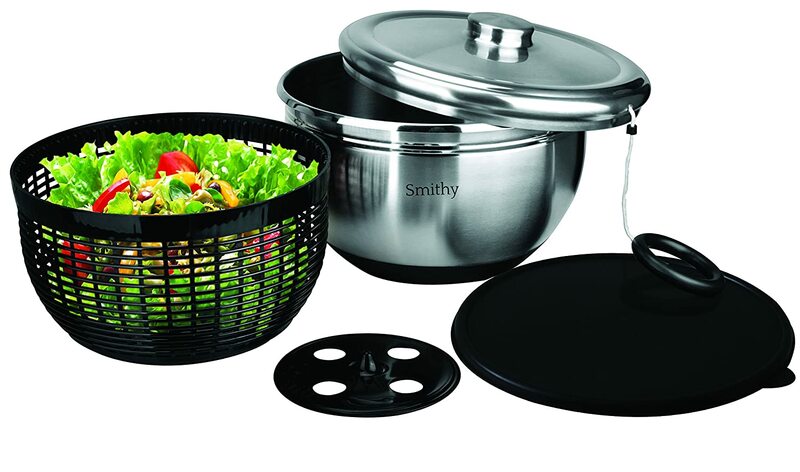 When you’re looking for a salad spinner with a luxury appearance and strong functionality, you have the answer in the Stainless Steel spinner by Smithy. This product comes with several parts that are all removable. The bowl, basket, rotating base and lids are all part of the kit. Between the black and stainless-steel hues, this salad spinner is perfect for hard-core kitchen use and serving needs. Although this product is priced higher than most of the others, look at the included features to understand why this spinner is worth the money. The first features that you’ll notice are the exterior colors. Most of the spinner is made out of stainless steel. This material is well-known for its beauty and durability. In fact, it’s corrosion-resistant for the life of the product. It can get wet and remain moist for hours at a time, and you won’t see any corrosion. The remaining parts are black plastic except for the bowl’s base. You’ll discover that the base has a non-skid, silicone construction. This detail allows the bowl to remain in place regardless of the spinning forces. As a result, you don’t have to worry about the bowl moving around the kitchen counter as you spin it. The internal basket allows the salad to remain in place as moisture flows into the surrounding bowl. Although you won’t usually use the basket at the dining table, it still has more uses besides holding your salad. Pull the basket it out of the spinner assembly, and use it as a colander. Don’t search for your colander that’s lost in a cabinet. The spinner’s basket works just as well as any mesh design. The spinner comes with the necessary lid that allows you to spin it, and the product also has another component. Leave your salad in the bowl. Use the included storage lid that offers a sealed edge around the entire bowl. With this lid, you can make a lot of salad with some leftovers for tomorrow. The sealed lid keeps the salad as crisp as possible as you save money on your grocery bill. When you’re done with the salad spinner, you don’t have to hand wash it. Place all of the components in the dishwasher. They’ll emerge clean and damage-free from any standard appliance. Be aware, however, that the plastic parts should be placed on a top shelf within the dishwasher. The strong, water streams at the appliance’s base won’t have a chance of damaging the plastic that’s several inches away. Place the stainless-steel components on the bottom shelf because they can withstand nearly any water forces. Some consumers have reported that the pull string, which is connected to the spinner lid, will break over time. This string is tough, but many jarring pulls can wear the material down. One consumer suggests that the string should be tied at the ring area in order to reduce the chances of the mechanism breaking. If consumers do observe an issue, they should always contact the manufacturer for further help. Many consumers today are concerned about plastic being used in their kitchen. Some plastics can leach chemicals into your food. The manufacturer is aware of this concern, and the designers created the spinner’s plastic parts out of BPA-free materials. No chemicals should be an issue in your salads prepared with this spinner. If you have any problems with the spinner, the manufacturer advertises a lifetime replacement guarantee. Although this statement may seem too good to be true, consumers have reported positive reviews regarding product issues. One part might be broken, but Smithy sends the customer a brand-new product as a solution. There’s no need to worry about replacing one part and figuring out how to manipulate the product. Smithy stands behind their salad spinner. Don’t limit yourself to just salads with this kitchen tool. You can use it to dry off nearly any vegetable medley that you want to saute or grill. Place your cooked pasta in the basket too. You can spin the moisture right off of the pasta pieces so that you can make a cool, noodle salad. The Smithy spinner has so many uses that you’ll be pulling it out nearly every day. Keep it clean, and you can enjoy healthy salads and other foods without much effort in the kitchen. In second place is the Good Grips spinner from OXO. This spinner has a unique look that’s sure to brighten up any kitchen. Choose from completely clear to light-green colors for the internal basket, and you have a tool that’s perfect for any decor. In general, consumers applaud this spinner because of its inherent features. From being dishwasher-safe to storage friendly, you have a product that’s strong and attractive as you prepare healthy meals for the family. It’s important to start out your product evaluation with a look at the spinner’s size. This salad spinner is large, and it’s meant to prepare salads for up to six people. The bowl is slightly larger than six quarts while the basket resides at a little under five quarts. If you want to feed fewer people, it’s a smart idea to look for a smaller product. This spinner will prepare food for a large family or frequent, friendly gathering. One of the best parts about this salad spinner is the spinning mechanism. There’s no string to pull because the manufacturer designed this spinner with a pump. Press the pump located at the top of the spinner, and watch the mechanism quickly gain momentum. You don’t have to wait for the spinner to slow down either. This spinner is equipped with a brake button. Hold it down so that the spinning action rapidly ceases. If you ever have a malfunction with the spinner, the brake option allows you to quickly open the unit without any injury from the moving parts. With so much force from the pump, you might wonder about the product’s stability. You’ll be thrilled to note that this product has a non-slip ring along its base. The ring grips onto almost any countertop surface so that there’s no slipping involved at different spinning speeds. The pump design also contributes to the sturdy, spinning action. As you press on the pump, that downward motion forces the bowl into place. 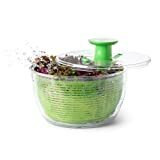 Between natural forces and the non-slip ring, you’ll have a safe salad spinner that even the kids can operate. When you’re trying to serve many people at a lunch or dinner gathering, you want a quick transition between the preparation containers and the dining table. The OXO salad spinner comes with an attractive clear bowl that you can easily move into the dining room. The clear design allows everyone to see the salad and tempt their taste buds. No one will ever know that the bowl is meant primarily to be for meal preparation. Consumers have reported that they appreciate the storage options for this spinner. If you have some salad that wasn’t consumed, you can keep the spinner’s lid locked down and place it in the refrigerator. Air won’t have a chance to decay the salad, which preserves its lifespan for slightly longer than without the spinner. After washing the spinner, you can easily stack it with the rest of your bowls because the lid is flat. There are no knobs or other obstructions to make stacking difficult. This spinner is nearly four pounds in weight, and that value doesn’t include any food within the basket. With this item weight, you’ll have no problems keeping the bowl in place as you spin. Allow the weight and well-designed forces to hold the bowl in place so that you can keep one hand free. Ideally, you should only use one hand to pump the product as you fill it with tasty items by using the other hand. Your OXO spinner will be a constant companion for your meals in the end. 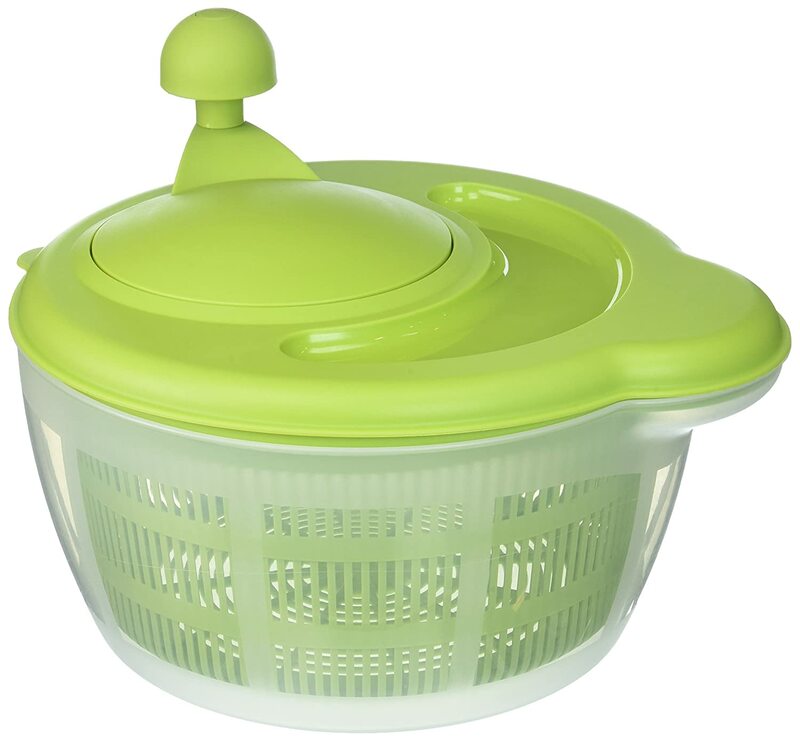 A distinct product coming out of Germany is the Salad Spinner from Westmark. This spinner comes with all of the basic accessories that you need to dry off your salads. It’s made of durable plastic, which makes it easy to clean by hand or machine washing. If you want a reasonably good price on your next salad spinner, take a close look at the Westmark model before you make any purchasing decisions. Your first purchasing decision revolves around the spinner’s color selections. Choose between apple green, dark red or standard red. These colors reflect the hues decorating the spinner’s lid and basket. The bowl is always an opaque, white color. Many consumers note that this salad spinner is an attractive option in any kitchen decor. Grab the large handles, and you’ll see how much thought went into this spinner design. Westmark knows that you’ll want to spin your salad as quickly as possible. Those large handles are meant to keep the bowl steady as you grab on. Other spinner models, in contrast, have few areas to hold onto during its operation. One concern voiced by a few different consumers is the lack of a locking lid. This design simply calls for a lid that rests on the bowl. The pressure of your hands will hold the lid down. Some consumers have no problem with this design, whereas others believe it’s a manufacturing flaw. Examine what’s important for your ultimate purchase because a locking lid isn’t really necessary on this particular spinner model. A main feature on this spinner is the hand crank. You crank this knob assembly in order to turn the salad in its basket. The knob is a large shape so that everyone’s hands will feel comfortable drying the vegetables. The smooth, cranking motion is a major benefit of this spinner’s design. Westmark stands by their product, so they offer a five-year warranty with your purchase. If any issues arise with the spinner, they’ll replace it. Keep your purchase receipt in case of any problems. The manufacturer will simply verify the purchase and move forward with their warranty process. In fact, Westmark doesn’t even require a problem to be present if you want a full refund. They want you to be happy with the product in every case. Westmark is a manufacturer that knows this spinner will be used by almost everyone in the family. With that fact in mind, the spinner is equipped with four, non-slip feet. Place the spinner on a flat surface, and you can spin many pounds of lettuce to dry perfection. Encouraging the household to eat healthy is simple when you have a handy tool to help you out. 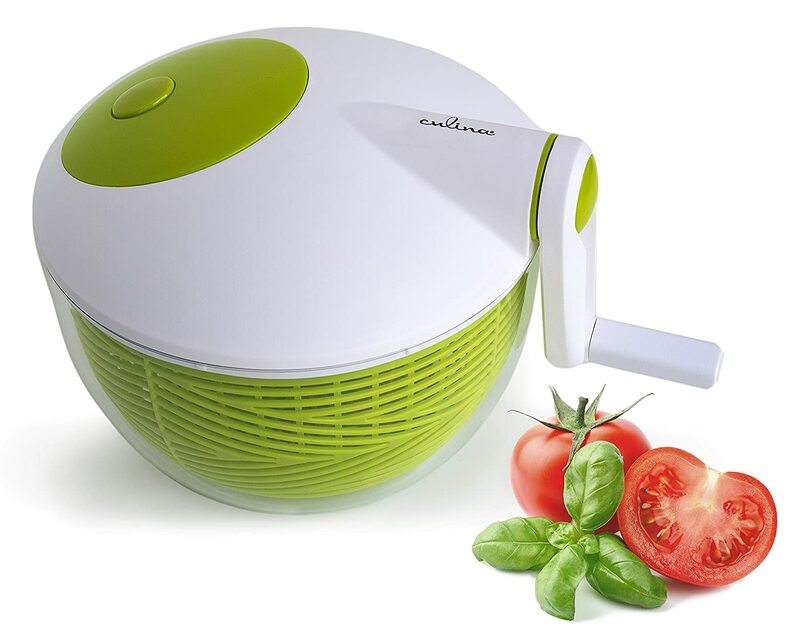 For less than $10, you can have a quality salad spinner by Culina. This model is named the “Space Saver” because of its compact and attractive shape. Other spinners might be bulky, but Culina knows that your counter space is almost always limited. Take a good look at this spinner, and you might be tempted to buy the budget pick instead of the high-end models. This spinner design is meant for a small household. If you’re single or a couple, the Culina spinner will serve you well. It’s a relatively small, three-quart container. This size is equivalent to two, generous salads. A busy household with many kids, however, would need a larger spinner. If you do need to use the Culina spinner for a large group, it’s possible to prepare the salad in groups. Simply move the spun salad into a separate bowl and continue with the spinning action. You have some flexibility when it comes to this small, spinning product. Culina designed this spinner with an ergonomic design. When you look at the hand crank, it’s not located in a horizontal position. Find the hand crank along the bowl’s exterior at a vertical angle. Turn it with either your left or right hands, and you’ll see how easy the leverage is with this design. For some older adults, this handle orientation is much easier on the body. You can use your whole body to move the crank instead of just your hand and arm motion. Some consumers have concerns about cracks along the plastic housing. This product has BPA-free plastic, which gives it some durability. Cracks aren’t a widespread problem, but you can avoid them by taking good care of your spinner. Avoid dropping the spinner or handling it in a rough manner. You can place it on the top shelf of the dishwasher, but you may want to simply hand wash it. In most cases, the spinner simply needs a good rinsing. Because this spinner is so small, it’s easy to store it in almost any cabinet. The handle is removable, but most consumers keep it permanently affixed. Stack the bowl and basket in a cabinet and rest the lid nearby. Many consumers simply keep it on their counter so that everyone is tempted to have a salad with each meal. Easy access means that healthy meals are easier than unhealthy ones. This spinner also has a brake function. Press the large button on the lid, and you almost instantly stop the rotating motion. This brake is helpful when you want to add more items to the bowl. Culina designed this spinner with a simple construction so that you can take it apart with ease. It has three main parts that are quickly hand washed and readied for tomorrow’s salads. However, don’t store the spinner with any wet parts. Allow them to air dry before any long-term storage times arise. Mold and mildew are opportunistic microorganisms that can set in on your spinner. Clean and dry spinner parts will remain viable for your next meal any day. When it comes to salad-spinner construction, not all products are made the same. In fact, most spinners have very different internal components compared to their similar exteriors. When you’re shopping for a spinner, be careful about the pivot point. This part is the point where the spinner rotates in place. A conical shape to a spinner creates too much force around the bowl, which contributes to a wobbly action. Look for bowls with sturdy and wide bases. They can spin with ease while maintaining a smooth movement. Wobbly spinners will only wear down in time with poor functionality noticed almost immediately by the user. Every salad spinner is meant to make vegetable consumption easier on a daily basis. If a spinner is too difficult to clean, you won’t use it as often as you should. As you look at different spinners, examine the basket. The basket is probably the most difficult item to clean. The colander shape should have equally sized openings so that food can’t be stuck in tiny areas. Ideally, the openings will be large enough to clean while retaining the bowl’s contents during the spinning action. The bowl and lid should be easy to clean as well. Most chefs want cookware that can be quickly transferred to the dinner table. The salad spinner is no different, so look for an attractive bowl that will complement your dining experience. The bowl might be clear, opaque or adorned with some decorations. Ideally, you should be able to spin your salad, add it to the bowl and serve it within minutes. You don’t have to use another bowl that only adds to the dish total for the evening. You might have a model with a crank, pull string or pump that you must use with each meal-preparation period. Before you buy a positively reviewed product, think about the spinning mechanism. If you have chronic aches in your hands, arms or shoulders, a cranking mechanism might be too difficult for you. Pull strings tend to be the most popular among consumers, but pumps are slowly becoming more mainstream. Pick the mechanism that works for your physical needs, and you’ll use the spinner on a daily basis. If you use your salad spinner each day, be sure to clean it out as thoroughly as possible. There are many tiny crevices inside of each spinner. Food particles that remain in the bowl will only break down with time. Keep your spinner looking and smelling fresh with a thorough soaking and scrubbing after each use. As a result, your entire household can have vegetables and fruits more often than before. In fact, kids love the spinning sensation as they turn the top knob. Allow them to participate in the salad preparation, and they’ll be a fan of fruits and vegetables during their entire lifetime.